Tile of fritware painted with blue and turquoise enamels. Oblong rectangular shape and form adjoining sections of a frieze. Along one long side is a border of interlaced arabesques reserved in a blue ground with touches of turquoise. In the centre of each tile is an oblong lobed panel containing arabesques reserved in a blue ground with touches of turquoise. Semi-circular panels with similar designs on each side. White background filled in with stylised flowers in blue and turquoise. One of two tiles with C.3A-1953. 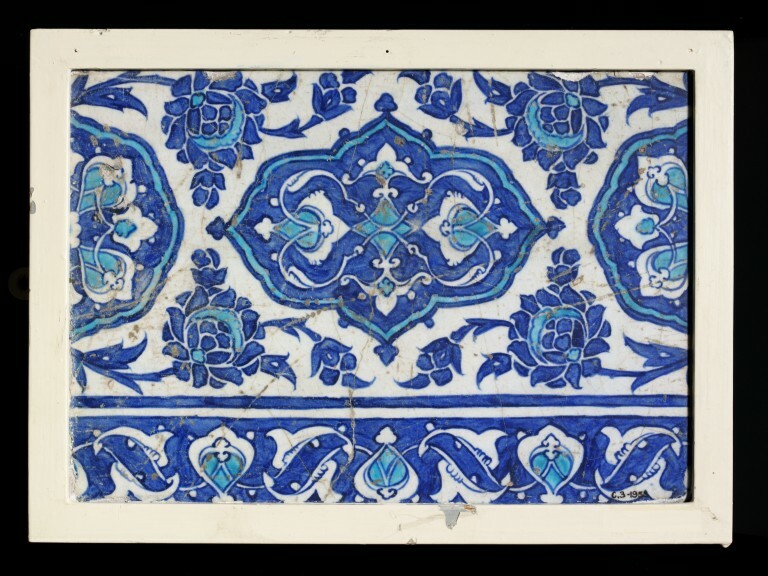 On 29 November 1952, Arthur Lane, Keeper of Ceramics and Glass at the Victoria and Albert Museum, received a letter from from John Arnold-Forster of Salthrop House, near Swindon, Wiltshire, offering the Museum a collection of tiles as a gift. Lane visited Arnold-Forster in Wiltshire on 12 December 1952 and made his selection of 26 tiles, bringing one back with him. The remainder were collected by van on 19 January 1953. The Director of the Museum wrote to thank Arnold-Forster on 13 February 1953. The gift included 15 tiles now identified as coming from the Çinili Hamam in the Zeyrek district of Istanbul, which were divided between the Ceramics and Glass Department and the Circulation Department. They were accessioned as C.2 to 6, 9, 10, and 12 to 14-1953 and as Circ.26 to 28 and 30-1953. 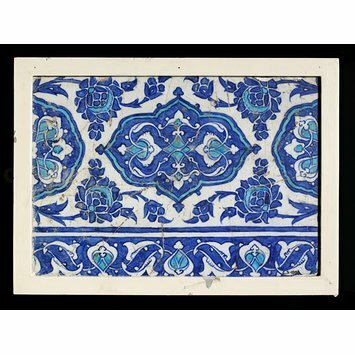 Tile of fritware painted with blue and turquoise enamels, Turkey (Iznik), ca. 1540-1550.